Michael Valentine Smith may have prevented a murder back in the summer of 1974 when my brother and I were stranded in Port Angeles, Washington for nearly ten days. In a Pinto station wagon. In the rain. It was day five or six. I remember the relentless drumming of water against the car roof. I remember waiting to take my shower in the campground’s bathroom, hoping someone would leave her soap or shampoo behind because I was out. I remember, in a what-the-hell moment, that we spent our last few dollars in an expensive touristy restaurant where my brother and I inhaled giant roast beef sandwiches that came with crisp pickles, french fries, and one little plastic cup of horseradish. I confess to leaving the ramekin of horseradish untouched and waiting for my brother to do what I knew he would do scoop up the cup of horseradish, ask “what’s this?” then, without waiting for an answer, squeeze the entire contents of the cup into his mouth. 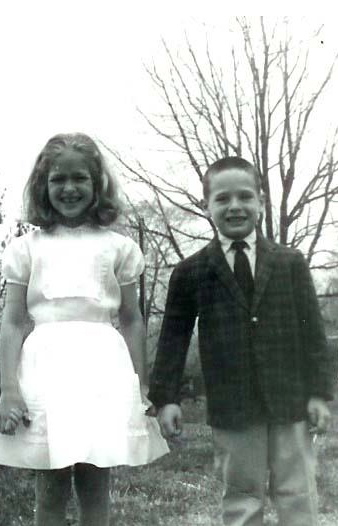 We knew each other well, my brother and I. We should have. He’s less than a year younger than me and I have no childhood memories that don’t include him. And, after three and a half weeks of traveling together in the 80-cubic-foot confines of my mother’s green 1974 Pinto station wagon, we’d absorbed knowledge of each other the way our sleeping bags absorbed the water dripping in through the window. Since our — okay, my — second fender bender we had not been able to close it all the way. I knew he’d eat that horseradish because at that point there wasn’t much we wouldn’t eat. After that meal, we were officially out of money. We had a few more days paid at the campground, a dozen packets of instant oatmeal, some tea, and a can of beans. That would be it until my mother could send a money order from the savings I’d left behind in New Hampshire. Our plan to pick up odd jobs failed when employers realized we were too young to serve liquor and not likely to stay through the summer into the fall. Besides, we smelled like wet socks left to rot in a gym bag for months. It was in Port Angeles that two events occurred. We had a huge fight and we met Michael Valentine Smith. The argument cleared the air, metaphorically speaking anyway. Michael V. Smith guided us back to each other. Want your own free copy to read or re-read? Scroll to the end of this post. The argument, in hindsight, was long overdue. Friction began to erode our bravado our fist day on the road when I rammed the Pinto into a car in front of us on the Tappan Zee bridge. Other sources: our rapidly dwindling money supply, the question of whose idea this trip was anyway (mostly mine with an unexpected assist from our mother who urged me to take her car, and my brother), and the tyranny of AM radio which alternated between The Hues’ Corporation’s “Don’t Rock the Boat,” and Diamond Earring’s, “Radar Love” until we were ready to gouge the radio out of the dashboard. Just a week or so earlier, he had turned 17 and I had turned 18. I was old enough to buy beer legally in Denver, a moment I had thought would stamp me as an adult. It didn’t work. Our inherent shyness, acute self-consciousness, and naive lack of planning exposed us for the kids we were. The country had turned out to be so much bigger than I imagined; a thousand miles on a map was a matter of inches. Driving that same distance on strange highways that took us further and further from the familiar mountains of home thrilled me on the one hand and, on the other, dissolved my vague and romantic notions that all we would have to do is get going and adventure would find us. I was embarrassed by the time we reached Port Angeles. Nothing was more painful than confronting my own incompleteness and there was my brother, every morning, every afternoon, every night, a witness to my failures. It added up to a combustible combination that seemed powerful enough that day to blow the doors off the Pinto. When we couldn’t trust ourselves to say another word, we reached for our books. Books were our refuge, our allies, and a source of confidence since we’d been little because we’d both learned young, at four and five, during nightly lessons at my father’s drafting table. After a while, the air stopped vibrating with tension and I remember being aware of the rain, the turn of pages, and my brother’s breathing. And then he laughed. “What?” I asked him, seizing this as an olive branch, or at least a sign that the storm had passed. I don’t remember the page he was on or what made him laugh but I saw that he was reading Stranger in a Strange Land, one of three Heinlein novels in a set he’d been given before we left. I’d already started it and wanted to keep going but it was, after all, his book. We started talking about the parts we had both read and then one of us, I don’t remember who, started reading it out loud. We took turns and kept taking turns until we finished it. Here was a character who, like us, was thrown into the deep end of an experience without any understanding of the people, history, culture, or landscape. Without preconceived notions and no self-consciousness, this character’s journey offered a few lessons about what it takes to really see, hear, and learn. I’m not sure we absorbed them though. It was enough to have found a way to talk with each other, to provide comfort and connection in the form of a great story and a trusted voice. Very little evidence of our road trip remains. The Pinto is long gone. So are the photographs of the waves crashing off the cliffs of northern California, the giant Sequoias, Ben and Ricky Sue who picked us up on the two days we hitchhiked around Vancouver Island and showered us with hospitality in the form of beer and a guided tour, icy blue Kootenay Lake in British Columbia, and many, many campgrounds in the US and Canada. The copy of “Stranger” is gone along with the books that followed, “The Moon is a Harsh Mistress,” and “Time Enough for Love.” Along the routes we took, we lost our fear of driving in cities and some of our shyness. We discovered that the world may be smaller than if feels sometimes when we found a car in Lake Louise bearing license plates from our Coos County in New Hampshire. We learned that fender-benders don’t define the success or failure of a journey and neither does running out of money in places like Port Angeles or, later, Medicine Hat, Alberta. When I think of this trip from a distance of thirty-nine years, I can see more clearly that when we left on our trip, my brother and I were strangers to ourselves and strangers to adulthood. We wanted to grow up, see life outside the White Mountains which had both shielded and imprisoned us. We were teenagers seesawing between seizing life and wanting life to leave us alone. When we came home, we had a lot of road left to travel but more confidence to do it. Since then, though, we have never had that much time together and we have never read aloud to one another. If I could get one moment of that trip back, I think I would ask for a stretch of highway somewhere out of the rain. I would be driving to the sound of my brother’s still-breaking teenage voice telling me the story of Michael Valentine Smith and taking comfort in being strangers together. I have such strong memories of this book, which was a kind of icon to me and my friends in high school and early college (I’m your age, more or less). I haven’t picked it up in at least 35 years though; wonder how it will have aged? Now I have to go down to the basement and dig out my old copy. I am really enjoying your writing, by the way. Hi, Jan, How fun that you too have strong memories of it. I just found an “uncut” version put out in the 90s that I am about to read. Thanks for commenting and thanks for the good words! Wonderful post. I used to live in Port Angeles (about a decade before you and your brother visited), so I know about the rain. Shortly after that period, I got heavily into science fiction, and Heinlein was one of my favorite authors. I think you’re right: we’re all strangers at some point in our lives, to ourselves, to others, to the places we live or visit. How long does it take to get comfortable in one’s own skin? I guess it’s different for everyone, but trips like the one you took (and like the one I took down the coast of Central and South America in 1974 – must have been a seminal year!) certainly hasten the process along. I get lost in your writing and the telling of your tales!! Exactly the way a good story should get one lost. 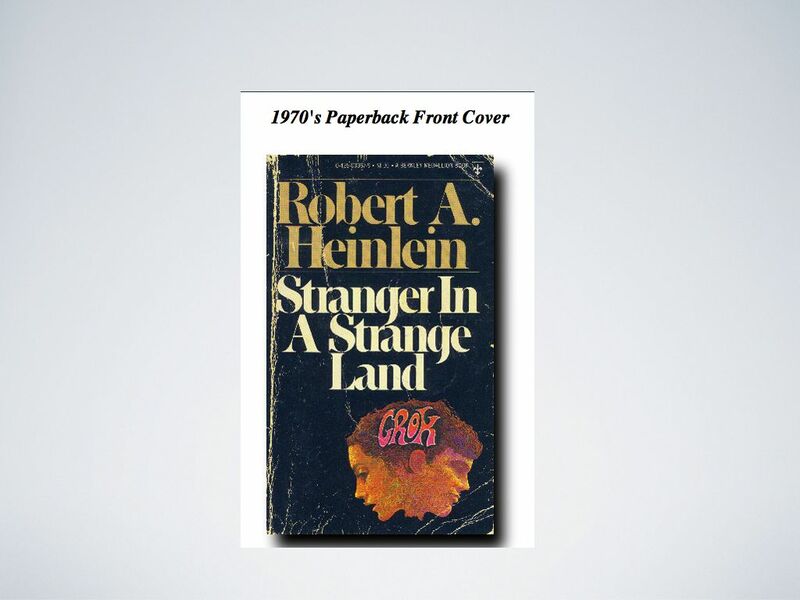 🙂 I have never read this particular book, or anything by Robert A. Heinlein, but with that one particular quote, feel as if I might be missing out on a treasure. 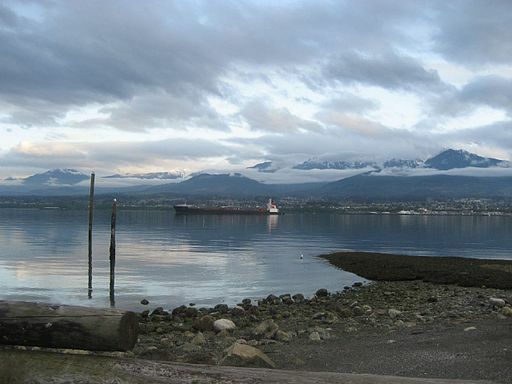 Since my ex-husband hails from just outside of Seattle, I had an opportunity to visit Port Angeles, and B.C., during one of our visits to the coast. It was quite beautiful. One thing I remember about our trip was a kitschy motel we stayed in. Each room was decorated with a different theme. You know, you just made me realize something good about my ex-husband–he was always up for an adventure, and exploring. I kind of miss having someone like that in my life, because I really don’t travel anymore as it’s not much fun when you do it alone. I remember the green pinto! When Pete and you drove off in it, I recall being mildly irked as it meant one less car in the yard to draw from! This is wonderful storytelling, Betsy. Thank god for that youthful spirit of adventure. Just stumbled onto your blog after getting a recipe for nasturtiums and I am really loving it! Always felt that everyone should drive across this country at least once in their lives. Thanks to you, I am remembering some of the books that inspired the roads that I took in the journeys of my youth! Ken Kesey’s ‘Last Go Round: A Real Western’ took me to Pendleton, Oregon, John Steinbecks’s Cannery Row to the California coast and Monterey–among a few! I am anxious to read ‘A Stranger in a Strange Land’ after reading about your own adventure:) I am looking forward to reading the rest of your blog, also! Love your writing and your tales! Am so excited to report that this past winter, I had the opportunity to return to the scene of my first adventure–highway 101 and see it 20 years later. Hands down, one of the best roads of all time!! Take care and again, really enjoying your site. Thanks, Catherine. It’s great to be connected. You’ve mentioned books I’ve always wanted to read and a road I love. Highway 101 is truly one of the best roads in the US, I agree. Have you ever taken the detour from Ferndale, CA to the beginning of “Lost Coast” park area? Took our breath away. Because I’m a fan of Katrina Kenison and follow her blog, I found myself at your blog. I’ve only read 2 posts, but I’m anxious to find some time to read your whole month of journeys and books. Welcome! And thank you so much for stopping to check out my blog. I”m love all these new connections and appreciate them so much.